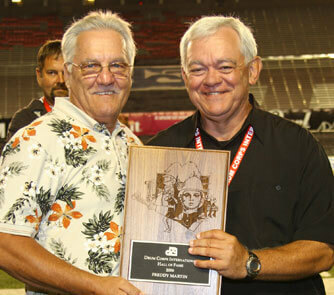 The July 4, 2003 Fanfare was about long-time Blue Stars director and DCI Hall of Fame member David Kampschroer. The following are a couple more comments about "Dr. K." First from Allison Scallan, who marched as a soprano player with Phantom Regiment from 1999-2003. Dr. K was our corps director in 1999. He used to always say he was the dad and we were all his children. He was kind of like a grandfather figure to most of us. One morning we came out to the rehearsal field and there was Dr. K with a lawn mower, cutting the grass for us. He just waved and went along like it was normal. He was willing to do anything for the corps. The last time I got to speak with Dr. K was at our end of the season banquet in November of 1999. You can imagine my surprise when I ran into him at a Blast! performance in Tampa years later and found out that he still remembered me. It's nice people like Dr. K that help make this activity even more enjoyable. plaque at the 2006 DCI World Championships. Tony Rendleman marched as a contra player in Phantom Regiment from 1998-1999. In the past he served as the corps' webmaster. The first time I heard Dr. K's name, I was standing on the field in retreat at Waukesha High School in Milwaukee during the summer of 1998. It was the home show for Pioneer, and they were honoring Dr. K on his retirement as the school's superintendent. Waukesha wanted to show him some thanks for his help and for what he did for the drum corps community. Fast forward six months: It's Thanksgiving weekend in the fall of 1998. Phantom Regiment had been through some rough times. The board of directors found a guy to help our, an alum from the original Phantom Regiment. It was this Dr. David Kampschroer guy again. I didn't know he was a Phantom Regiment alum from the 1950s and 1960s. It was at this introduction that I learned that he had been a former executive director of Drum Corps International in addition to running the successful Blue Stars in its heyday. Jump ahead another couple months. Dr. K announced that some plans were in the works to bring the Phantom Regiment Web site up to date. Regiment was an innovator in the drum corps Internet experience, thanks to the help of the Farrell brothers, but the site had not kept up with the Internet advances. After camp, another member and I approached Dr. K about having us assist with the Web site. This was a pretty big challenge for a college kid, designing and maintaining a site with more than 50,000 hits a month, but Dr. K had confidence in me. Summer came and from my perspective, it was Dr. K that kept that year's corps on the road. After the season, I continued my work with the Web site and in the fall we learned that Dr. K, who was brought on for only a year, would not be the corps director that next year. A couple years passed, and I found myself at Madison's Camp Randall Stadium. Dr. K was there introducing the new class of DCI Hall of Fame inductees. I ran into him in the stands later on in the evening, he called me by name and asked how I was doing. So, for a brief moment in my life, I again was in the presence of drum corps greatness. I have never met a man in my life from whom I've gained more insight, knowledge and confidence. Dr. K has influenced the drum corps community greatly, but I am sure that it is the many individual lives he has touched that makes him truly great. Editorial assistance by Michael Boo.